While many of the Buddha images were cheap replicas for which such permission could have been easily obtained, one sandstone image of the Buddhaâ€™s head was an artifact of historical significance, he said. The image probably dated back to the Khmer Empire, could be up to 1,000 years old and probably changed hands many times before its seizure at the airport, K. Ruthai said. Permission to export Buddha images can be obtained at the Thalang National Museum, which is run by the Fine Arts Department, he added. 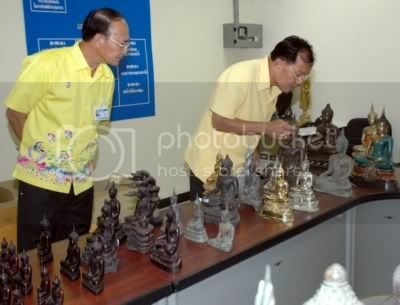 If tourists are unsure whether Buddha images or items they are considering buying require a permit for export, they should ask the shop owners selling the items, he said. For more information call the Thalang National Museum at 076-311426 during government office hours. I found two large Buddhas for sale on Ebay U.S.A.
interesting listing… I don’t think they’re buddhas though. statues in the likeness of local saints?